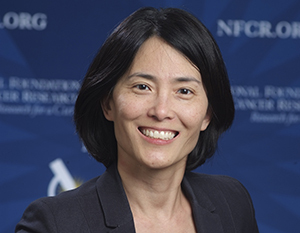 Alice T. Shaw, M.D., Ph.D.
Dr. Alice Shaw’s laboratory focuses on developing new strategies to overcome lung cancer treatment resistance – specifically for anaplastic lymphoma kinase (ALK), ROS1 and RET genetic mutations in non-small cell lung cancer (NSCLC). By utilizing a large panel of laboratory research models that were uniquely created at Massachusetts General Hospital, Dr. Shaw and her team developed a new platform to rapidly identify drug combinations for lung cancer patients whose tumors have stopped responding to targeted therapy. Using this platform, they identified several effective drug combinations, including some options that standard testing would not have predicted to work. Moreover, Dr. Shaw and her team assessed tumor biopsy samples to identify biomarkers that could predict how the patients will respond to the combination therapies. These biomarkers may greatly help doctors determine which patient will respond to the newly-discovered drug combinations. With further refinements, this strategy might be used to select the optimal treatment for each individual patient. Since 2014, Dr. Shaw has been leading several clinical trials and translational efforts aimed at overcoming drug resistance for patients living with ALK+ NSCLC today. Previously, she was the lead investigator for the global registration studies of crizotinib (Xalkori®) and ceritinib (Zykadia®), which led to regulatory approval of both drugs in advanced ALK-rearranged NSCLC. She was also the lead investigator for crizotinib in ROS1-rearranged NSCLC. She is now focusing new research on the most common site of metastasis for ALK+NCLC – the brain – and looking into why these tumor growths become resistant to crizotinib. Her team launched a clinical trial with the newest ALK inhibitor – lorlatinib – and they are using both tissue and liquid biopsies to identify genetic alterations that may be driving the resistance. Lastly, since the majority of ALK+ NSCLC patients have no smoking history and do not respond to recently-approved immunotherapies like nivolumab (Opdivo®) or pembrolizumab (Keytruda®), Dr. Shaw is researching the immune microenvironment and other mutations in tumors which may underlie the low response to the new therapies. Alice T. Shaw, M.D., Ph.D., received her B.A. in biochemistry at Harvard University and her M.D. and Ph.D. degrees from Harvard Medical School (where she is currently an Associate Professor). She then completed her residency at Massachusetts General Hospital and her postdoctoral work at Massachusetts Institute of Technology. Dr. Shaw was also a fellow at Massachusetts General Hospital and is currently the Director of Thoracic Oncology and an Attending Physician there. In addition to her funding from NFCR, Dr. Shaw has been awarded other research grants throughout her career, including from the Damon Runyon Cancer Research Foundation, the Burroughs Welcome Fund, the V Foundation for Cancer Research, Uniting Against Lung Cancer and the National Institutes of Health. Your ticket for the: Alice T. Shaw, M.D., Ph.D.